Flood Brothers Disposal presents The Skinny and Houli show and opening this show this week we have a very special caller from County Kerry, Alex Fegan. Alex is bringing his new documentary, ‘Older than Ireland’, to The Century Center Cinema, Chicago from June 10th – 16th. Alex tells us about how he got the idea for the documentary, it’s roaring success here in America and in Ireland and we hear a little about some of the characters in the documentary who are all over the age of 100. This is a must see, folks! Our first live guest is the one and only, Katie Grennan. Katie tells us about what she has going on including her upcoming trip to Japan with The Irish Trinity Dance Company, her experience playing and dancing live onstage with The Chieftains and of course, her upcoming trip to Ireland with Skinny and Houli. Katie brought her fiddle and she plays “The Station Master’s Waltz” for us. Our second guest is Galway’s Mayor, Frank Fahy. 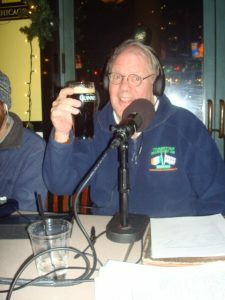 Mayor Fahy fills is in on what he’s been doing since he arrived to town and the guys share stories of their experience in the beautiful city of Galway. We hear the local death notices in ‘Who Died?’ and upcoming events including Skinny and Houli’s Trip to Ireland information night at The Cork and Kerry Irish Pub on June 14th. Katie plays us out this week with a reel but not before Houli tells a great joke! We have a great variety of guests on the show this week and beautiful music as always by Katie Grennan.